This book lets you increase strength, power, agility, and quickness and take your game to a much higher level. "Complete Conditioning for Tennis" details how to make the most of your training time with exercises, drills, and programs designed to assess your fitness level, improve footwork, increase speed and flexibility, enhance stamina, boost mental focus, and prevent common injuries. Additionally, the 90-minute DVD takes you on court and into the gym to demonstrate the drills and exercises used by the pros. 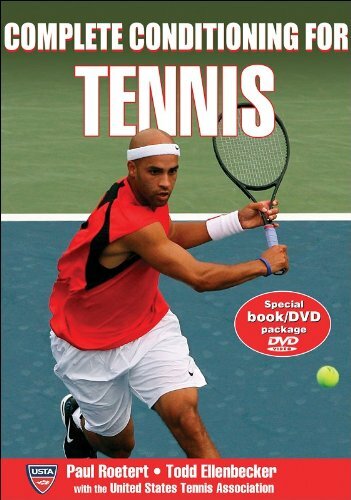 Endorsed by the United States Tennis Association, "Complete Conditioning for Tennis" is simply the best guide to developing the highest level of athleticism for success in the sport. Paul Roetert is the Managing Director of High Performance at the USTA compound in Key Biscayne. He is a noted speaker in tennis training and biomechanics and is responsible for the development of USTA junior players into future ATP and WTA stars. Todd Ellenbecker is the director of a sports physiotherapy clinic in Arizona and works closely with the USTA through their sports science committee. He also acts as a consultant to three Major League Baseball teams.